This article is the first in a two-part series about research reports. This month, we discuss a strategy to help students organize information. In our April 2009 issue, we talk about the writing process. Read Part 2 here. Although students typically enjoy the researching process, writing about the information they have learned remains the daunting task. If we were to take a step back and reflect on the cause of this discouragement, we would see students grappling with the initial step of the research writing process. This leads us to the essential component that is missing from our instruction on research writing — organizing the research. As classroom teachers, we must explicitly teach our students how to organize the information they have learned. We have found that providing our students with an organizational tool for sorting their newly discovered information ensures that they will be able to successfully arrange their information in a systematic and manageable manner. This easy and student-friendly approach enables the report writing to automatically flow from the organizational stage. Each student will need a manila folder with eight library card pockets attached to the inside of the folder. Each pocket should be labeled to identify the type of information that should be stored in that pocket (see Diagram A). 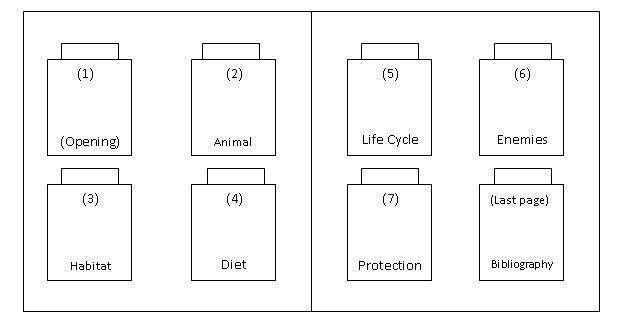 For instance, for an animal research paper, these eight labels could range from animal description to animal diet. These labels should reflect the information you want your students to focus on during their research. Diagram A. Manila folder layout for animal research report. Now your students will have a tool to organize their new learning, but they will not know how to use and sort their newly discovered information if we do not provide them with direct and guided instruction. Taking time to walk through this process as a whole class will ensure that all of your students understand the value of this organizational tool. You want to show your students how the label on the pocket represents the main idea of the paragraph and the information they place inside the pocket on index cards represents the details supporting the labeled main idea. Diagram B. Sample index card. For instance, let’s consider the pocket labeled “habitat.” The main idea of this paragraph is going to be the habitat in which the animal lives. The information we place in the pocket is going to contain only information we learn about the animal’s habitat. To practice this task, give each student the same article on a specific animal’s habitat and an index card. Guide students through this process by having them highlight any information they find that relates to the animal’s habitat. 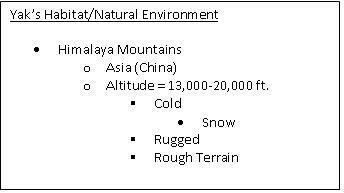 For example, if the yak is the sample animal, the index card may look something like Diagram B. Notice how the notes on the index card are no more than three words per line. Using this technique will ensure that your students are not plagiarizing any text and will have to rely on their own ability to create sentences from their notes. Once students become familiar with this organizational tool, they will have a new understanding of the layout needed to create a coherent and well-organized research report. You will find your students motivated and excited about working on their research report and, more important, equipped to succeed with this difficult task! A one-page pdf document that provides instructions for creating the manila folders and taking notes discussed in this article. This article was written by Tracey Allen and Clarissa Reeson. For more information, see the Contributors page. Email Tracey and Clarissa at beyondpenguins@msteacher.org.